Yes! 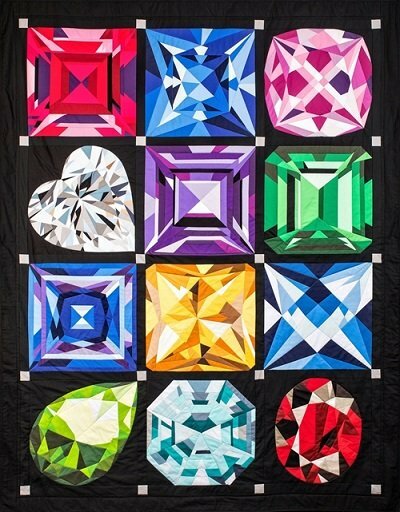 We have a birthday party schedule every month this year and heading it all up is our certified instructor coming to teach the Birthstone Series Quilt by MJ Kinman. You have seen it in all of the magazines and now you can join us in making these spectacular quilt blocks. This class is more than a club and more than just a block of the month. Each month we will gather to have a birthday party and celebrate the birthstone of the month beginning with the Amethyst in February 2019. This block utilizes the freezer paper technique to make a different birthstone each month. It looks luxurious and it is but we will walk you through each step, each month, and in no time you will be a master of the technique. When you are done you will be the envy of all quilters who have admired this quilt. Our Kick Off date is February 9th and we will be working on the Amethyst stone. We will start at 10AM for this first meeting so we can fully explain the process and get you started in time to finish your first block. In March we will adjust our start time (likely 1pm - 4pm or 5pm) so that the entire class is comfortable and achieving all that needs to be done during class. This class is for very confident beginners and intermediate quilters. Requirements: Please bring basic sewing supplies including your sewing machine, if you would like to sew on one of ours simply call ahead and be will be sure to move one to the classroom for you. Also bring basic sewing supplies including scissors, pins, a rotary cutter, a quilters ruler and thread to match your project.